This new CD features 3 complete press conferences. Of most interest is perhaps the Honolulu conference on November 20, 1972. This is where Elvis again talks about his forthcoming Aloha From Hawaii special. 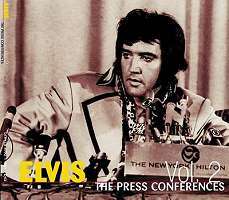 Elvis is totally at ease on the two first press conferences. At least it sounds like he is! On the third one, however, Elvis is obviously uncomfortable! He is very nervous and hardly adds anything during the conference. His mind is absent and his speech is slur. The CD is presented in a nice digi-pack - a classic EU trademark. The selected cover photo is a bit odd, though. Showing Elvis in June 1972, from his Madison Square Garden conference, it has nothing to do with the content on this specific CD. There are several good photos from the conference held in Honolulu and it would have made more sense to use one of these! The Press Conference Vol. 2 offers value for money. The price is only 120 DKK.